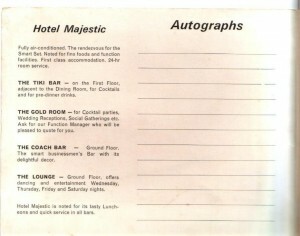 This entry was posted in 1950's, 1960's, 1970's, Clubbed Out, Clubs and tagged Majestic hotel. Bookmark the permalink. We ran Phase 4 out of the Majestic. It had such a great illuminated dance floor. Hey Abby, yes the majestic was a great venue. I did go to Phase 4 too. Can you send me a date and I will include your club on the list. I agree that Briz has lost many nice buildings. 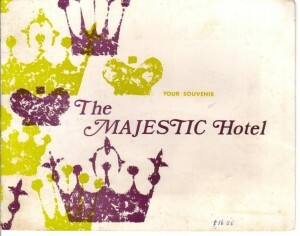 I remember the Majestic very well, very classy indeed. The National Hotel is also mentioned in your Post. When we first came to Brisbane I played in the band in Warrens Bar (National Hotel) circa 1969. That venue was the ‘in place” with the flowery Warren putting on his “show” behind the bar. Sadly I do not have any Passes or other items but I do have a newspaper article about Warren. hi, do you remember a barmaid named Kaye Saunders? She worked at the National Hotel, Wilson 1870? This was late 1969 to early 1970. Hey anyone out there who might know of the names of bands that played at the majestic hotel in July 1973- October 1973 would be fantastic trying to reconnect with family & any information would be very appreciated rock on !! I’m trying to find my Birth Father. I was adopted out. My Birth Father was with my Birth Mother named Kaye Saunders in Brisbane, Qld, in February or March, 1970. She was a Barmaid in Brisbane, and married at the time with children. Birth Mother doesn’t want anything to do with me.. I would like to chat off-line. I think a Kaye Saunders went down to Sydney in and might have known people I’ve met. I was born about the same time as you so anything I have is third-hand and yet I might be able to give you some more names to research.